K-State students and military spouses gathered for a luncheon May 6 at the Beach Museum of Art in honor of Military Spouse Appreciation Day. The luncheon was the inaugural recognition celebration of a day K-State's Institute for the Health and Security of Military Families hopes to observe every year. Speaking at the luncheon was Sharon Gerdes, College of Human Ecology alumna, author and military spouse. The first Resilience Awards also were bestowed. While spouses and K-Staters visited over lunch, they learned a little bit more about each other and build relationships. Many women and a handful of young babies were in attendance. Fittingly, Gerdes spoke about the postpartum period of pregnancy and what it meant to her to be a military spouse. 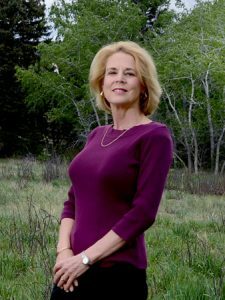 Gerdes opened with her connection to the military — her husband, Dave, a retired Air Force pilot. As a military spouse, Gerdes was her husband's support person when he was home and otherwise taking care of herself. When their first child was born premature and required a neonatal intensive care hospital stay, Gerdes remained by his side constantly. By the second week of her newborn's life, Gerdes was experiencing postpartum psychosis that was observed by those around her. Gerdes was removed from the hospital in a straightjacket, medicated and was admitted to an inpatient mental illness facility for two weeks. After this experience, Gerdes turned to fiction to explain the subject of postpartum psychosis. 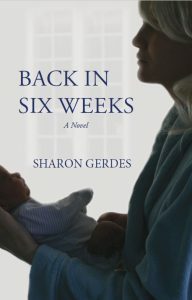 Her second book, "Back in Six Weeks," is inspired by her own recovery from postpartum psychosis. In the case of military spouses, she wanted to emphasize that the military is a community with help and resources — that they all need to be looking out for one another. Checking in with new moms to determine if they are getting enough sleep, if they are eating enough and if they are reaching out for the assistance they might need is key, Gerdes said. "You are not alone, you are not to blame and with help you will get well," was Gerdes' universal message to the military spouses at the luncheon. This ties into the resiliency that military spouses are often recognized for providing unwavering support for their partners. Gerdes earned a Bachelor of Science degree in foods and nutrition from K-State. She is an author, motivational speaker and certified food scientist. Currently, Gerdes manages an international consulting firm and is tasked with developing strategic partnerships on behalf of the U.S. Dairy Export Council and Dairy Management Inc. Gerdes has a blog and has written more than 70 articles for food industry publications. Gerdes is the vice president and public relations chair for Postpartum Support International. Resilience is a quality mentioned over and over again, said Briana Nelson Goff, director of the Institute for the Health and Security of Military Families and organizer of the Military Spouse Appreciation Luncheon. The institute recognized two recipients of the inaugural Military Spouse Resilience Award: Sara Devine and Carolyn Toliver-Lee. Devine is a K-State graduate with bachelor's degrees in geography and secondary social studies education. She will work as a special education teacher in Junction City and begin work on a Master of Science in special education at K-State in fall 2016. Devine is a constant support to her husband, who was diagnosed with post-traumatic stress disorder, anxiety and insomnia after his war deployment. Toliver-Lee is a family advocacy program specialist at Fort Riley and has master's degrees from K-State and Northcentral University. Toliver-Lee has a conflict resolution certificate from K-State and works with the Child Abuse Prevention Campaign. Her husband sustained a traumatic brain injury and was medically and honorably discharged from the military. In 2004, he sustained another severe closed traumatic brain injury, which left him temporarily blind and paralyzed. He currently receives full-time care from the U.S. Department of Veterans Affairs in Topeka, and the support, love and encouragement of his wife and sons. This article was posted on Friday, May 27, 2016, and is filed under College News, Family Studies & Human Services, Food, Nutrition, Dietetics and Health, Institute for the Health and Security of Military Families.